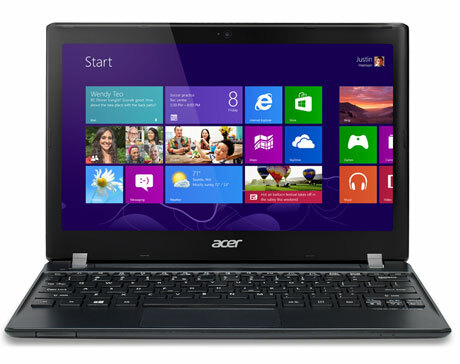 Acer is announcing a $400 Windows 8 laptop available to the Canadian market starting today. The TravelMate B113 doesn’t have some of the notable features of some other Windows 8 hardware we’ve seen released in the last quarter of 2012. There’s no detachable screen to become a tablet, nor is there a touch screen to interact with Windows 8 new tile based interface. But what it does offer is some respectable power packed into a thin and light form factor that promises long battery life. Acer’s new Windows 8 notebook. The 11.6-inch screen offers more real estate than the Surface tablet, and the Core i3 processor boasts more power (enough to run Windows 8 pro and all those legacy Windows applications you’re hooked on.) Also included is 4 GB of DDR3 memory (upgradeable to 8 GB) and a hard drive that will store up to 500 GB of data. The screen has an anti-glare surface and runs in an HD resolution of 1366 by 768. Related Story | Acer unveils $500 Windows 8 hybrid tablet. Not the most impressive specs to come to market lately, but it’s all fit into a one-inch thick profile and weighs three pounds. The six-cell battery is said to last for seven hours of use on a full charge.